Newspapers and their earlier incarnations as pamphtets (produced by “pamphleteers”) can only thrive in a particular environment. To state the most obvious requirement, they need readers. That means they do well in large towns or urban centres or, possibly, across a rural area where distribution is manageable. A printing press and someone with the skill necessary to operate it are also required. Printers in the 18th and 19th century were a guild and a craft unto themselves, highly regarded and very conscious of their artisanal expertise. Newspapers also require something worth reading about. Typically newspapers emerge where there exists an educated, literate middle class who are interested and engaged in civic debate. The pages of the press become a forum in which government policy, moral issues, and local developments are debated. They are, one might say, a means of policing power and community behaviour by creating a common language and a shared conversation. In this respect, the press lends itself well to critiques of established authority. In colonial times, such critique was not always easy. The earliest post-Conquest newspapermen in British North America were often persecuted by representatives of British power and Loyalism. Figure 11.5 Le Canadien was the mouthpiece of the Parti Canadien from 1806 to 1810. It’s motto was “Nos institutions, notre langue et nos droits” (Our institutions and our language, our laws). It exemplifies the professional, middle-class values that were at odds with anglo-Toryism and the oligarchy. In all of the colonies the press provided an effective platform for dissent and criticism. Newspapers were easily and widely distributed. Robert Gourlay (1778-1863) used the Niagara Spectator as an instrument of political opposition. Haligonian Joseph Howe (1804-1873) was more Tory than Reformer when he took over the Novascotian in 1827, but it served him well when he became a critic of the colony’s Family Compact. 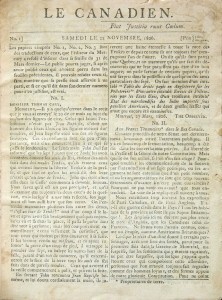 The Parti Canadien — the opposition to the ruling British Party — used the newspaper Le Canadien beginning in 1806 to speak on its behalf; some 20 years later Papineau’s more militant Parti Patriote acquired La Minerve as a mouthpiece for its issues and its critique of the Château Clique. In Upper Canada, Francis Hincks (1807-1885) published the Toronto Examiner with the masthead, “Responsible Government,” William Lyon Mackenzie’s Colonial Advocate was a pulpit for radical-reform sentiment, and their near-contemporary George Brown (1818-1880) was the brains and drive behind the very ambitious Globe and the leader of the Clear Grits. These three newspapermen were instrumental in creating the language of opposition to the Tory establishment and, importantly, to the less radical elements on the Reform spectrum. At the tender age of 19 years, Edward Whelan (1824-1867), an Irish-Catholic immigrant and former apprentice to Joseph Howe, started the first of his several newspapers and journals on Prince Edward Island. Whelan’s declared goal was “to investigate and assail, if not remedy, the evils which have grown out of the Landocracy System, a system whose principle is ‘monopoly,’ whose effect is oppression.” He, like Howe and Brown, would become a Father of Confederation. Similarly, on the West Coast, Nova Scotian Amor de Cosmos (born William Alexander Smith, 1825-1897) established Victoria’s Daily British Colonist in 1858, and John Robson (1824-1892), an Upper Canadian on the mainland colony, took charge of New Westminster’s British Columbian in 1861. Both men launched withering attacks on Governor James Douglas and other members of what they identified as British Columbia’s own Family Compact. Both were early advocates, too, of responsible government and a continent-wide union of British North American colonies. Both eventually became premiers in British Columbia. The importance of the press as a political instrument was lost on no one. In 1864-65 John Schultz (1840-1896) took over the Nor’Wester, Red River’s first newspaper, using it as a bully-pulpit against the HBC. By 1869, however, he had switched directions and became a spokesman for Canadian interests on the Prairies. Schultz played politics with bare knuckles and his sleeves rolled up, but his understanding of what the press could accomplish was perhaps of unparalleled importance in Canadian history. Some editions of the Nor’wester reputedly never made it to the streets of Red River: he sold the lot in the political hothouse of Toronto, cynically cultivating interest in annexing Rupert’s Land and whipping up opposition to the provisional government led by Louis Riel. Newspapers in the first half of the century tended to be small, running to no more than eight pages. The first successful news-focused newspaper was Brown’s Globe. His objective was to produce a document containing the freshest and most important developments from everywhere, and in this way expand his readership. He was so far ahead of his competition that even his political enemies had to read the Globe. News became easier to gather with the availability of telegraph technology; mass production of the Globe raced ahead with the early application of steam-powered presses in the 1860s. Brown’s predecessors and smaller competitors had more in common with 18th-century pamphleteers than with the newspapermen of the late 19th century. Newspapers reflected, created, shaped, and mobilized opposition to the oligarchical regimes. Journalists and publishers were part of an emerging middle class that advocated greater individual rights and freedoms. The distance from the printing press to an active career in politics was often a short one. 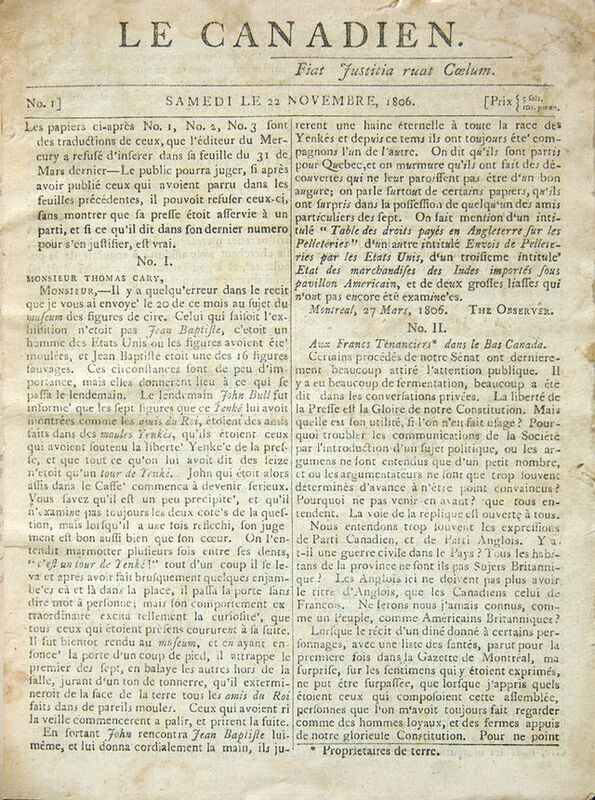 Le Canadien Nov 22, 1806 by BeatrixBelibaste is in the public domain. 11.7 The Press by John Douglas Belshaw is licensed under a Creative Commons Attribution 4.0 International License, except where otherwise noted.